As my glowing review of their 2013 Dallas concert attests, The Aristocrats are one of the hottest live bands to come along in years. They're the kind of band teenage boys dream about: "What if you took the best guitarist, the best bassist, and the best drummer, and put them in a room and told them to make a band...?" It's no teenage dream, boys and girls, it is The Aristocrats. The instrumental trio is now up to three (studio) albums and counting. As the band themselves mentioned at the concert I attended, the first two albums didn't really capture the essence of the band since, after all, The Aristocrats are first and foremost a live band. Any experienced recording artist will tell you what a struggle it is to capture live energy in a recording studio. So while the first two albums were certainly exciting, they lacked that live performance explosion that you'll get to enjoy, should you ever have the opportunity to see the band in-person. The interesting thing about Tres Caballeros, released this past June, is that the band found a viable way to remedy the "it's not live when it's in the studio" problem: They became a studio band, multi-tracking instrument parts, adding special effects, and creating sonic textures without having to even attempt a "live performance" vibe. The result is no less spectacular than Aristocrats fans could expect from three of the hottest musicians in the instrumental music world. Take the elaborate "Jack's Back," for example. The song is a barrage of interesting guitar tones, which dance and weave their way through a song that is alternately soft-and-delicate and heavy-as-a-real-heavy-thing. The band has made a specialty of blending quiet passages with full-on-freight-train passages over the course of its previous albums, but on this tune the ability to leverage multi-tracking and studio effects makes the quiet parts quieter, the heavy parts, heavier, and the overall ambiance of the piece a true listening roller-coaster. At the same time, they maintain the classic Aristocrats personality and spirit that makes them who they are. Of course, Tres Caballeros is a lot more than just "a normal Aristocrats album, plus studio tricks!" album. The compositions themselves have evolved, and to my ears, the evolution has been along two distinct lines. First, it seems that guitarist Guthrie Govan has pushed the band toward more rockabilly influences. We hear this both directly, as in the case of true rockabilly tour de force "Smuggler's Corner," and indirectly, as in the case of, say, "Texas Crazypants." The title of this latter tune certainly evokes rockabilly imagery, but unless you're listening for it or paying close attention to track titles, you won't immediately hear the extent of its compositional "rockabilliness." Meanwhile, in a song like "ZZ Top," we might expect a direct send-up of Texas blues or indeed the aforementioned rockabilly. Instead, what we get is a demonstration of the second way I think the band has evolved since their last effort. This second strand of evolution is more obvious if you follow drummer Marco Minnemann's work outside of The Aristocrats, specifically the Levin Minnemann Rudess album (which I reviewed here). LMR is very much an old-school-prog, sonic textures album, which until now served as an interesting contrast to The Aristocrats' straight-ahead instrumental explosiveness. On Tres Caballeros, it seems this element of Minnemann's musical personality is in greater focus. A major upshot of this second development is that it clears a wide sonic birth for bassist Bryan Beller to do his thing. As a fan of his since my mid-teens when he was playing in Dweezil Zappa's band, I am always on the lookout for an opportunity to hear Beller stretch himself and lay down his wonderful and elastic bass lines. Tres Caballeros happily delivers this in spades. 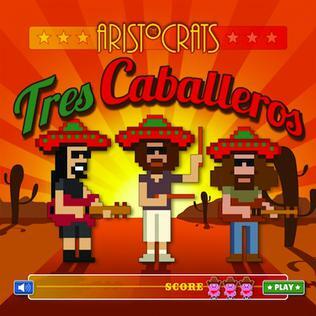 Tres Caballeros is an exciting album that showcases the band's growth together as a band. While fans who prefer all solos, all the time might find fault in an album like this, I find the performances actually more stunning considering the music's compositional complexity. Those who expected more of the same from The Aristocrats will be surprised - and if you're like me, delighted - to discover how much more the band has on tap to offer us fans. The album courses through peaks and valleys of higher and lower energy, delivering something both fresh and classic Aristocrats. The bottom line: The Aristocrats have crafted another must-own instrumental rock album while subtly evolving into a band that promises more varied, and equally classic future albums. My overall rating: A-.